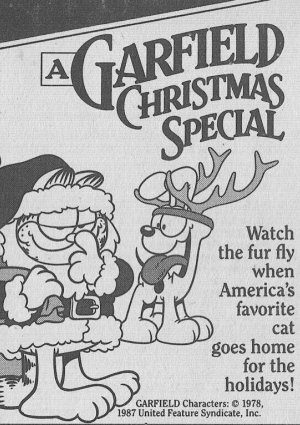 Garfield, Jon and Odie go to Jon’s grandmother’s house for Christmas, where Garfield finds a present for Grandma. **The special was first broadcast December 21, 1987 on CBS and was rebroadcast on CBS every year thereafter until 2000. Fox owned the rights to rebroadcast from 2000–2008, but did not do so. It was only recently rebroadcast again in 2008 on ABC Family. The special was first broadcast December 21, 1987 on CBS and was rebroadcast on CBS every year thereafter until 2000. Fox owned the rights to rebroadcast from 2000–2008, but did not do so. It was only recently rebroadcast again in 2008 on ABC Family.